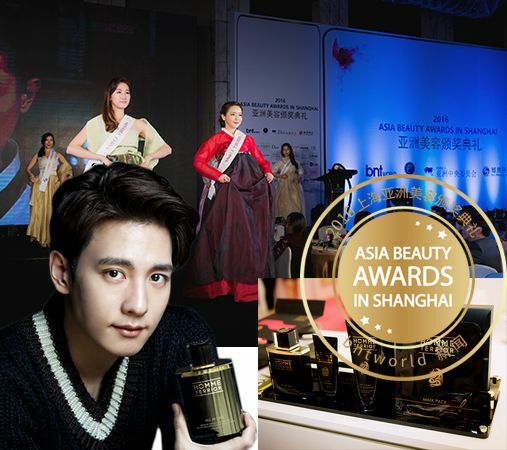 [by Hwang Ji Hye /translated by Kim Young Shin] Homme Terrior, a men’s beauty brand launched by Hwajin Cosmetics, was awarded as Global Homme Icon Cosmetic at ‘2016 Asia Beauty Awards in Shanghai’. With its long experience in cosmetic production, Hwajin Cosmetics manufactures functional cosmetic products made from selective ingredients. The company has systematic procedures of quality management, research and development. Its men’s brand Homme Terrior is recognized as a leading producer of men’s beauty goods. Homme Terrior All-In-One and Dynamic BB Cream’s ingredients include resurrection plant, which revitalizes even in the driest environment, apricot kernel oil and meadow foam oil, which are rich in vitamin. Their lightweight and refreshing formula captures the hearts of male consumers. Asia Beauty Awards aim to establish a standard to evaluate Korean beauty brands to help consumers to wisely choose their cosmetic products.